Welcome to Peters Creek Retirement & Assisted Living Retirement Community, where caring hearts is what we have, and caring for our residents is what we do. Our brand new memory care wing is complete, where specially trained nurses and staff are dedicated to providing the unique level of care that residents with memory loss require. We offer private, semi-private, and friendship suites in our memory care community. With our award winning service, convenient and beautiful setting, and fine resort quality dining, our residents always have endless opportunities to enjoy what Peters Creek Retirement & Assisted Living has to offer. 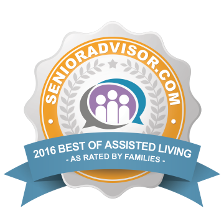 Please call or visit, and you'll see right away what a caring place Peters Creek Retirement & Assisted Living is. Located within minutes of downtown Redmond, Washington, our community is a warm home-like environment with shopping, including Redmond Town Center, Microsoft, churches, and medical care centers such as Overlake Hospital and Evergreen Hospital. It's the perfect senior housing facility for families living in Redmond, Kirkland, Bellevue, Woodinville, or Carnation. Have a glimpse of all of the fun and activities in store for this month!